The World Showdown of Esports is back with another world-class esports competition! We are thrilled to announce a return to one of our previously showcased games and an opportunity for a WSOE Champion to defend their title. 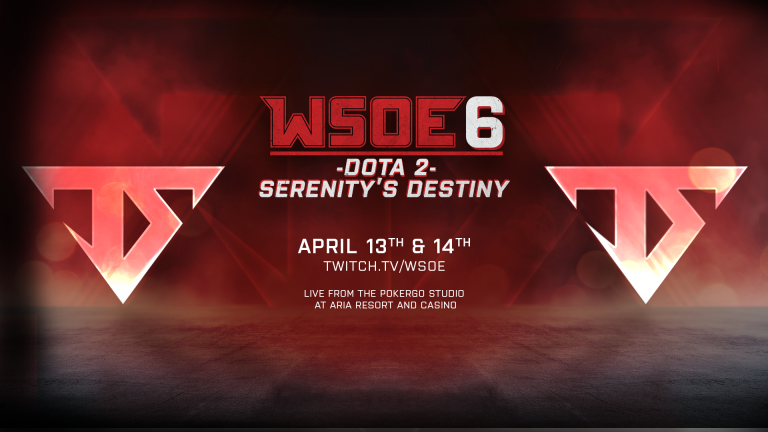 WSOE 6: Dota 2 – Serenity’s Destiny will be a unique event featuring four invited international teams vying for the chance to face our reigning champion from WSOE 1: The Dota 2 Showdown, Team Serenity, and attempt to claim the title for themselves in one final high-stakes match! Our four invited teams will have some new faces to cheer for in the form of Infamous Gaming, GGNGG, and Team Team. Also returning will be our WSOE 1 runners-up, J.Storm, who will be seeking redemption with another chance to prove themselves as Champion material at WSOE 6. The first day of the event will be a double-elimination tournament of best of 3 series matches to determine which team will challenge Team Serenity for the title. Day two will feature the Final of the Contenders bracket, followed by the Championship Match: one final best of 7 series between Team Serenity and the top contender from day one to battle for the title of WSOE Champion! Tune in to http://twitch.tv/WSOE on Saturday, April 13 and Sunday, April 14 for all of the team-fighting and spell-slinging action. Streams begin on both days at 9:30 a.m. PDT! Please note: this event will take place in a closed studio and will not have a live audience.